Descriptions:1-Amino-4-naphthalene sulfonic acid sodium salt is a greyish-white crystal.The sodium salt of industrial products contains two or four crystal water. It changes slowly into a rose colour in air.It is easily soluble in water and soluble in 95% of alcohol.Its chief use is employed in organic pigments or the sythesis of intermediates of azo-dyes. 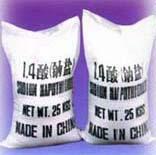 Packing:In plastic woven bag of 50kgs nett or 25kgs nett each with plastic lining. Notes:Put in dark,cold and air through place to prevent sun light.